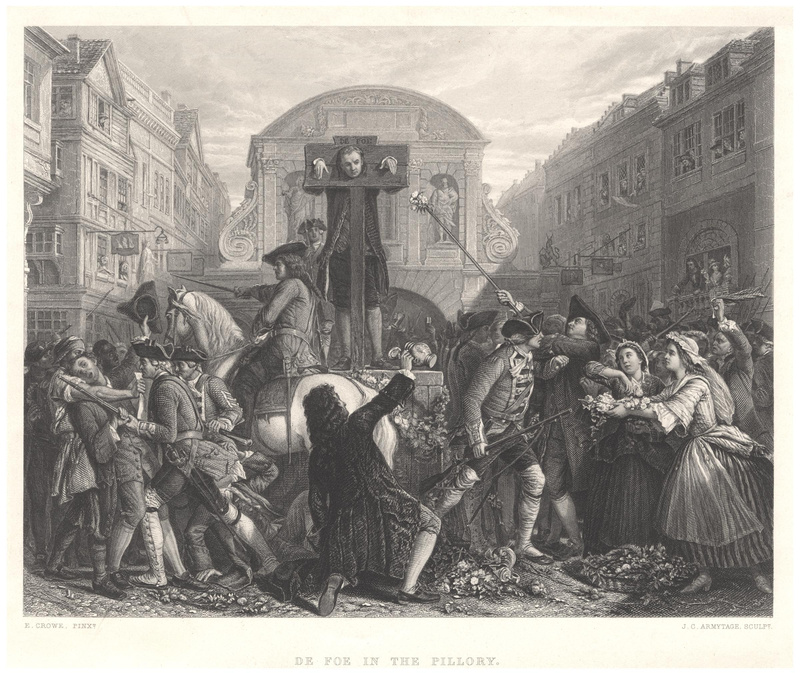 Daniel Defoe, who later went on to author the novel Robinson Crusoe, was put in the pillory on July 31, 1703. His crime was seditious libel related to a satirical pamphlet he wrote defending freedom of religion. The problem was that Defoe did too good of a job of mimicking those he was actually trying to mock and everybody took the work seriously, ultimately resulting in the near ruin of Defoe. Born in London in 1660, Daniel Defoe came from a family of successful non-conformists. His father had been a butcher, and Daniel made a living trading in wool, wine, and hosiery. He was also outspoken about and active in the social and political issues of the times and was not afraid to dissent against the majority. Defoe fared well when William II was on the throne. He was a favorite of the King, and he became more daring in his political exploits and writings. Things took a drastic turn for the worse for him when William died in 1702 and Queen Anne ascended the throne, as she would not tolerate dissenters or non-conformists. This was the same year Defoe’s pamphlet The Shortest Way with the Dissenters; or, Proposals for the Establishment of the Church was released. It was written in response to the Anglican Tories passing the Act Preventing Occasional Conformity, which, in a nutshell, forced everyone holding public office to practice Anglican worship, rather than just showing up occasionally to take communion to fulfill their legal obligation, but otherwise not bothering with the Church of England. Tis vain to trifle in this matter. The light, foolish handling of them by [prison], fines, etc., tis to their glory and advantage. If the gallows instead of the [prison] and the gallies instead of the fine were the reward of going to [their places of worship], there would not be so many sufferers. The spirit of martyrdom is over. Eventually, Defoe’s printer was forced to rat him out as the author of the failed satirical pamphlet and he was tried at the Old Bailey and sentenced to a large fine, jail time (until he could pay off the large fine), and three excruciating days in the pillory. You may think that’s not such a bad deal given the times, but depending on what the crowds decided to do to you while you were locked up and at their disposal, the pillory could be a death sentence, or at least leave you potentially permanently maimed. If you were lucky, it was just extremely unpleasant. Then there was the fact that Defoe didn’t have the money to pay the fine, meaning he effectively had a life sentence in prison unless someone bailed him out. While waiting for his punishment, Defoe composed a poem about his upcoming ordeal entitled Hymn to the Pillory, that, legend (probably false) has it, inspired such sympathy among Londoners that passersby threw flowers at Defoe instead of less desirable objects while he did his time in the pillory. Whatever the case, he seems to have emerged from the pillory with body still intact and ears un-nailed to the wood, as sometimes would happen. Unfortunately, he didn’t have the money to pay off his debt and instead spent the next few months in Newgate Prison until Robert Harley, 1st Earl of Oxford and Earl Mortimer, bailed him out and paid off many of Defoe’s other outstanding debts in exchange for Defoe’s services as a political writer (read propagandist), among other things. Great post. I never really thought about how ugly the pillory could be. I read Robinson Crusoe to my children last year – they loved it. The story never gets old. We consider it survival training, because you never know when you’re going to get stuck on a deserted island. Although the physical pillory no longer exists in Great [?] Britain nor its American former-colonies, a psychological pillory most assuredly does exist. Today, in the “West” (especially in England, the U.S., and Canada) all “dissenters” from the alleged wisdom of our times are locked up and exposed to constant abuse by the extremists that make up the great majority of the media, entertainment, and academia. Sadly, justice (everlasting glory or punishment) is not likely to be experienced until we die and our souls move on to heaven or hell.